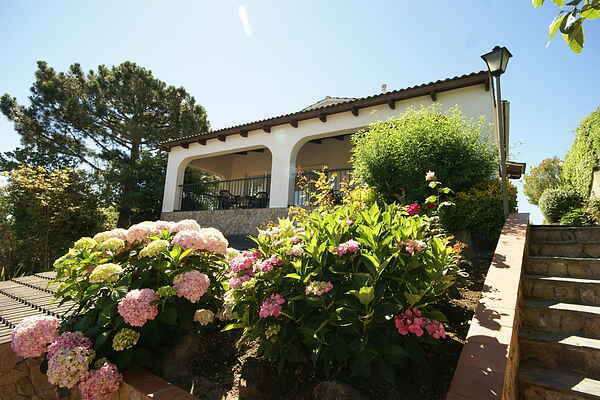 Comfortable detached villa with a very well-kept interior. This pleasantly house which is built against a hill, has a lovely private pool. The pool with sun terrace and lounging chairs is wonderfully secluded at the back of the house and slightly elevated. Enjoy the wonderful view of your surroundings, the hills near Vidreres and the Pyrenees in the distance. The multi-leveled garden is beautifully overgrown with large hydrangeas, yucas, agaves and rose bushes. The large covered terrace with seating area and that magnificent view is perfect for long nights with a glass of \"vino tinto\" and some nibbles from the stone barbecue. Look for beach fun in Lloret de Mar (7 km). But don't overlook the lovely bays between Lloret de Mar and Tossa de Mar, or between Lloret de Mar and Blanes, all very much worth a visit! It's great fun to visit these places by boat. The coastal road from Lloret to the historic Tossa de Mar is breathtaking with its fortified walls, towers and winding roads. Of course Barcelona (70 km) is the highlight. Definitely a must-see: the Sagrada Família, Gaudí's ever unfinished life's work. Not to missed is a leisurely stroll along the Ramblas.